Back at home in their Nineveh Plain town of Qaraqosh, the children learnt ‘Aboun Bashmayo‘, or ‘Our Father…,‘ in their original Syriac tongue. Now, as refugees, they were singing ‘Forgive us our trespasses, as we forgive those who trespass against us‘. 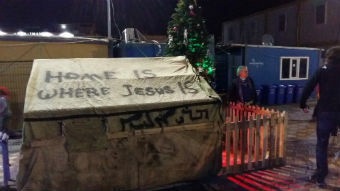 The Lord’s Prayer echoed in the Botroses’ container-like caravan, one of many hugging the church of Mar Elia in the northern Iraqi city of Erbil. 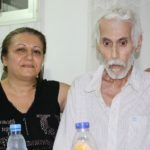 Nissan Botros, his wife Bernadette, their children and grandchildren are among more than 120,000 Christians who two summers ago fled the Islamic State’s onslaught in the northern part of the country. 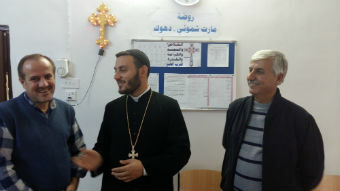 Together with 116 families, they have taken shelter at the church in Ainkawa, a roughly three-square-kilometre area in Iraq’s Kurdish region, and one of the few pockets still left for Christians in the whole of the country. “After [the Islamists] daubed the ‘Noon’ on their homes in Mosul, the Christians there left in our direction,” said Bernadette, referring to the Arabic letter ‘N’ for ‘Nazrani’ (not dissimilar to the ‘J’ for ‘Juden’ in Nazi Germany), with which the Islamists used to mark their new subjects’ properties for seizure. We are now looking at your family photos on your laptop. We’ve also torn down the Christ images around your home! The Christians in nearby Qaraqosh and Bartella were offering the displaced from Mosul necessary help before they in turn became themselves refugees. “My niece was called by the new IS occupants of her home. They taunted, ‘We are now looking at your family photos on your laptop. We’ve also torn down the Christ images around your home!‘” recalls Bernadette. IS might have hoped to sever the ties the Botroses and others felt for their Christianity, but they have failed. “From that first rough night, right up till now, the church has been there for us,” stated Bernadette. “The church was for us like a pomegranate, with us being the seeds all embedded in it,” Nissan agreed. And a renewed spirit of Christian unity was also evident. “I belong to the Ancient Church of the East,” said Fr. Daniel. 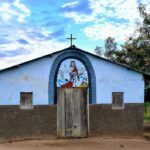 “This [Mar Elia] church is used by three communities: the Chaldean Catholic, the Assyrian, and the Latin Roman Catholic,” he added, testifying to a rich Mesopotamian Christian mosaic. “We are all working together here. We pray and worship together,” the 25-year-old priest said. The church was for us like a pomegranate, with us being the seeds all embedded in it. Apart from spiritual support, the physical and psychological efforts by the church were obvious. With photos on the wall behind him showing colourful activities, Fr. 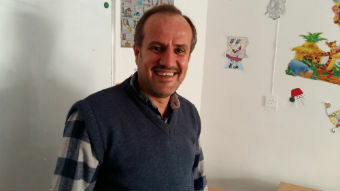 Daniel lists “language-learning, music – hand-in-hand with a catechism school,” serving 150 displaced children aged seven to 16 who now call Mar Elia home. “There is also a nursery of 190 children running,” he gently boasts. “Music classes on four different instruments: the piano, violin, flute and guitar,” he told World Watch Monitor. 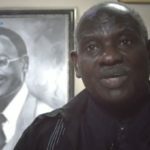 “Wherever they are going, they’d respect the traditions and culture of the country, while keeping their own traditions. This is really important too,” noted Fr. Daniel in his simple jumper, with his clerical collar hanging loose at one end. Earlier this month, a group of 150 Christians already flew from Mar Elia to Slovakia to start a new life. Here, talk of an active present strangely coalesces with future hopes and painful memories. “Cars came to a standstill. Thousands of them could not move on the congested road to Erbil,” said Nissan, recalling the night they made their flight from Qaraqosh on 6 August, 2014. “We had to leave everything and walk on foot”; a second checkpoint at the entrance to Erbil had to make sure no IS militants slipped in unnoticed. If ISIS stole everything you have – your homes, all – they didn’t steal your joy. “We climbed on board, with the cargo. Once in Erbil, we were in no shape to enter a hotel. 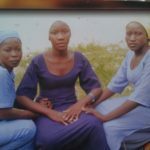 We had to cover our feet with plastic bags so as not to soil the floors,” both Nissan and Bernadette said. The family could afford the hotel for only two days. They then came to the Mar Elia church grounds “huddled under a tree to keep the children and the elderly from the scorching sun. We slept the night rough. There were no blankets, nothing,” they said. “A night to remember!” interjected one of Nissan’s younger children, a teenage girl. Next morning people were suffering stomach problems and diarrhoea. On the first anniversary of leaving Qaraqosh, Fr. 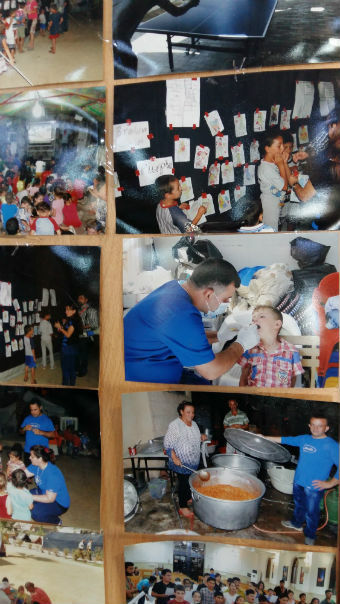 Daniel helped arrange a three-day festival at the Mar Elia ‘refugee’centre. Dreams and hopes were completely blasted away, from the root up. Fr. Daniel really hates the word ‘refugees’. “They are our relatives! They are not just refugees!” he protested. “One of the drama acts was about how they left Qaraqosh – and, you know, everyone started to cry,” he said. Yet Fr. Daniel’s visible joy and his air of innocence contradict the sorrowful reality of what happened to his “relatives”. “Some neighbours stole what the Christians left behind. They used to live together and share life there! We heard of Muslim neighbours helping ISIS, guiding them to the houses of Christian doctors, engineers, etc.,” he said. “They think this country is vomiting them out!” noted the Ancient Church of the East priest about his community. “This country doesn’t want them anymore, in spite of their being native people of this country. They are thinking of starting a new life in a country which respects their humanity, a country where they can be educated and have jobs. Not like here! Everything is different here,” he said. This loss is felt by the Christians, irrespective of denominational lines. Fr. 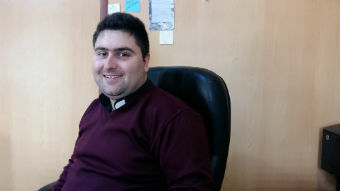 Daniel Behnam, a Syriac Orthodox priest, was displaced together with his parishioners from Baashiqa, another town in the Nineveh Plains. “We left behind homes, structures etc. A whole life behind!” says Fr. Behnam, many of whose flock are at present staying in Dohuk, in northern Iraq. “But seeing someone even worse off than yourself makes you stop and think: I can start anew,” he said. 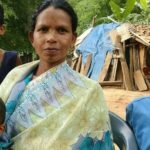 Letting go of a former life aids the healing process: “We closed the door behind, knowing there was no turning back,” he said, recalling the last time they left Baashiqa after being told the IS advance was imminent. “But one thing we would not do! We would not submit!” Behnam said, rejecting the clear choice of converting to Islam on pain of death, or subjugation under Islamic rule enacted by ISIS. The Christians chose to leave and lose everything rather than being treated as second-class citizens. They would not stay and swear allegiance to the Islamic State, as Firas, one of Fr. Behnam’s company, was asked to do by a Muslim neighbour who stayed behind. And as the faithful filed out of the mass, celebrated at the heart of Mar Elia, a sense of renewed assurance was palpable. Refugee tents long ago gave way to caravans, and in Nissan’s it was physically much warmer than expected, especially this time of the year. “May God forgive them!” was all he had to say, when asked how he’d wish to confront his dispossessors. Yet, it was harder to excuse those who “have sown such hate in their minds in the first place”. “Last year we had the ‘Jesus tent,'” said Fr. Daniel, referring to a tent on the grounds of Mar Elia housing a traditional nativity scene. “A very powerful message for everyone”. “In spite of being in a tent, we can celebrate the birth of the Prince of Peace”. At Nissan’s nearby caravan, the children, this time in Arabic, were singing the words uttered two millennia ago by another Middle-Eastern, the apostle Paul. “Being poor, yet making many rich,” said the song.